Russia’s top private-sector oil producer Lukoil has quit its gas block in Saudi Arabia after years of fruitless attempts to inject fresh impetus into the project and agree favourable commercial terms. But the company says cooperation with state Saudi Aramco may continue in third countries. Lukoil also reiterated its interest in returning to Iran, where collaboration with other Russian firms could be possible. Russian producers, including Gazprom Neft, are actively looking to strengthen strategic footholds in the Middle East. "We are pulling out of Saudi Arabia," Lukoil President Vagit Alekperov told reporters on the sidelines of the St. Petersburg International Economic Forum, adding that Aramco would take over the wells drilled at Area A, which was being explored by their joint venture, Luksar. He says Lukoil would partially compensate Aramco for plugging the wells. Lukoil, which entered the block in the Rub Al Khali Desert back in 2004, held 80 per cent in the joint venture, although Aramco was last year considering raising its 20 per cent stake to 50 per cent. Nine exploration wells were drilled, with only a few successful, recording tight gas finds. But the key bone of contention for Lukoil was how to monetise the gas, which it would have had to sell to Aramco for a fixed domestic price. In a surprise move in December, Riyadh increased natural gas prices to $1.25 per million Btu after they had been at a world low of 75¢/mmBtu since 1998. 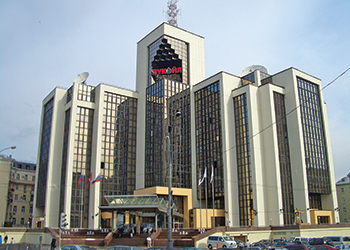 Further price hikes are in the cards, although there is no clear time frame, and this was obviously not enough to persuade Lukoil that development was economically viable. Alekperov says he discussed the Luksar divorce with Aramco chairman Khalid Al Falih, also the Saudi energy minister, in Vienna, and the two firms "agreed that we will stay partners." "We are interested in joint projects outside Saudi Arabia," as Al Falih wants Aramco to participate in international projects, he added. Alekperov says joint projects would be in the Middle East, while there were no plans on tie-ups in Russia. Meanwhile, Alekperov confirmed Lukoil is still waiting for Iran to unveil a new upstream contract for foreign investors as it looks to return to the country it was forced to withdraw from because of US sanctions. He confirmed the company’s interests in Iran do not overlap with those of Gazprom Neft, which recently says it is eyeing the Azar and Changuleh fields in the Anaran Block near the Iraqi border. Lukoil and Norway’s Statoil were working at Anaran before pulling out in 2011. "We are not looking at Azar and Changuleh," Alekperov says. "Gazprom Neft is holding talks independently. Our fields are located on the Anaran Block, but they are not Azar and Changuleh." "Plus, we are looking at two big fields in the central part of Iran," he adds. Asked whether there might be cooperation between Russian firms in the Islamic republic, Alekperov says Lukoil was "open to setting up consortia" and ready to join forces with other Russian companies interested in Iran but first needs to see the new upstream contract. Asked the same question, Gazprom Neft boss Alexander Dyukov replied: "Everything is possible." Alekperov was also quoted as saying Lukoil had agreed that, starting next year, it may take 4 million-6 million tons (80,300-120,600 barrels per day) of Iranian crude to supply its refineries. Sources confirmed Lukoil’s trading arm, Litasco, earlier this year sent one cargo of Iranian crude to the company’s Isab refinery in Italy.